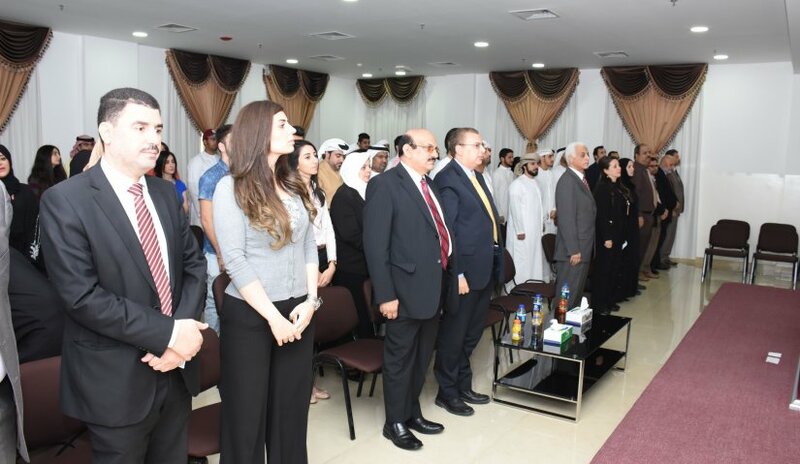 Under the slogan “Together towards Excellence”, the Student Affairs Unit at Al Falah University collaborated with the College of Business Administration, Mass Communication and Law, organized a ceremony to honor outstanding students for their active participation to activities within the University and external events. Deans, faculty members and administrative staff also attended the ceremony. Prof. Nasr Abbas, College of Mass Communication faculty member, appreciated the spirit of perseverance, merit and creativity of the students, as evident in the outcomes of the seminars, workshops and trainings they participated in. Dr. Khalid Heneidi, Dean, College of Mass Communication and Dr. Mohammed Desouki, Dean, College of Law handed the Certificates of Appreciation to the students. Towards the end of the ceremony, students expressed their appreciation to the administration and management. Dr. Reneh Ramsis from the College of Mass Communication distributed prizes to the winners of the contest held as part of the ceremony. A lecture on "Litigation Procedures in Light of the Code of Civil Procedure"